Materials used to manufacture kayaks have come a long way since the days of seal skin on driftwood frames. While there are still new kayak designs based on the concept of a skin on a frame, albeit with modern materials, the vast majority of kayaks today are made from composite materials or plastic. Composite materials have the upper hand when it comes to stiffness and weight, but there is no doubt that plastic in general is the more durable and also more affordable option. Plastic kayaks are made by three different processes, each with different advantages and disadvantages. Blow moulding (used by Prijon and a few others) is a process that has stood the test of time. Blow-moulded kayaks can be made of polymers like HTP; a very stiff and durable polyethylene. The downside is that the moulds are prohibitively expensive. The nature of the process also results in limitations on the shapes and features that can be moulded. Thermoforming, on the other hand, utilises a variety of different thermoplastics, such as ABS, to create stiff and durable kayaks. This process is used by Delta, Native and a few other kayak companies. The technology and materials come at a price though (literally) and it also means that there is always an actual split line in the kayak where the two halves of the kayak are joined. The majority of plastic kayaks are made by the process of rotational moulding, or rotomoulding as it is commonly called. The advantages of rotomoulding are numerous. Complex shapes can be moulded, the aluminium moulds are relatively inexpensive (compared to other plastic processes) and the material is affordable. The main disadvantage of rotomoulding is that very few types of polymers can be successfully used. The polymer that is the mainstay of kayak manufacturing is LLDPE (Linear Low Density Polyethylene). LLDPE is a tough and durable material; qualities that resonate well with kayakers. It is quite flexible, which explains why rotomoulded kayaks tend to be on the heavy side. Wall thicknesses have to be beefed up to create sufficient stiffness. The holy grail for rotomoulded plastic kayak manufacturers is to find the right balance between durability, stiffness and weight. 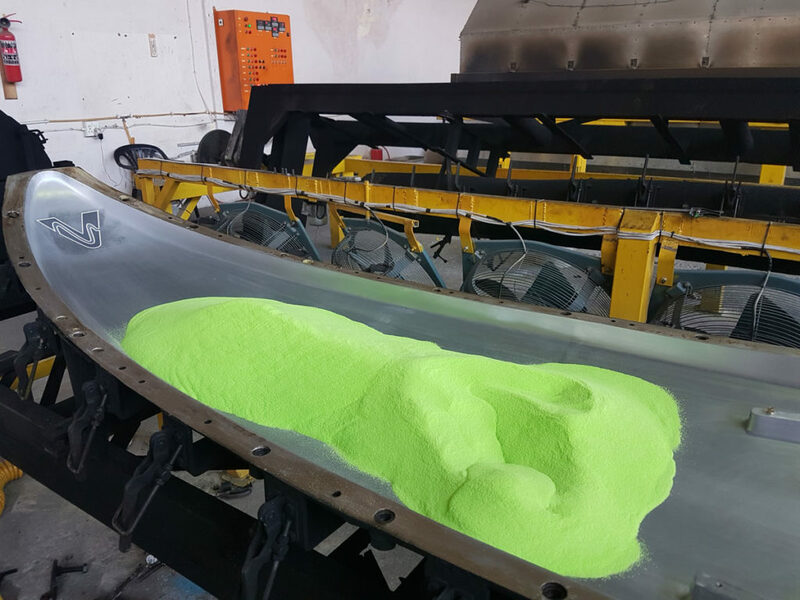 The most interesting development in this regard is the use of foaming agents to create a double or triple-layer system that combines the durability of PE with the stiffness and weight saving of a foam layer. In this process, the first step is to rotomould a solid LLDPE skin. The thickness of the skin is determined by the application. Rotomoulders with good process control can mould a thicker skin where high wear is expected, with a thinner skin where the focus is mostly just on dimensional stability. The second step is to rotomould a second layer of LLDPE that has a foaming agent mixed into it. The foaming agent is activated once the layer has been moulded. The resultant expansion of the foaming agent creates a foamed LLDPE layer that is highly rigid and also buoyant. It is a difficult process to master, but, if done properly, the foamed PE has a closed-cell structure and it is perfectly bonded to the solid LLDPE skin. Sometimes a third layer of solid LLDPE is rotomoulded to sandwich the foam layer, creating a perfectly smooth inside surface. This is mostly done in open canoes where the surface finish on the inside of the boat is just as important as that on the outside. Most rotomoulding companies stay away from this foam system as it is notoriously difficult to achieve consistent results with the process. Those who do, use it for different purposes. Some use it to create lighter kayaks at the expense of long-term durability by making the outside solid PE skin relatively thin and using the foam to create the bulk of the rigidity. Other companies use the foam layer to create kayaks that weigh the same as normal kayaks, but with the added advantage of much higher stiffness. The added stiffness increases performance on the water, reduces oil canning, and creates extra buoyancy that makes the kayak virtually unsinkable if it fills with water. The only disadvantage of the foam system is that it does not handle point-loaded high impact very well. For this reason, the foam system is not used in whitewater kayaks where impact of this sort is part of the game. Because of the difficulty in getting consistent results with the foam system, most companies that use the technology offer it is as an extra, for which they charge more. There is one exception though: Vagabond Kayaks. Launched at PaddleExpo 2018, Vagabond Kayaks decided to use foam technology as standard on all of their sit-on-top kayaks, from their small kids sit-on-top to their double-seater family sit-on-top. It is a game changer to have this technology applied on such a scale. 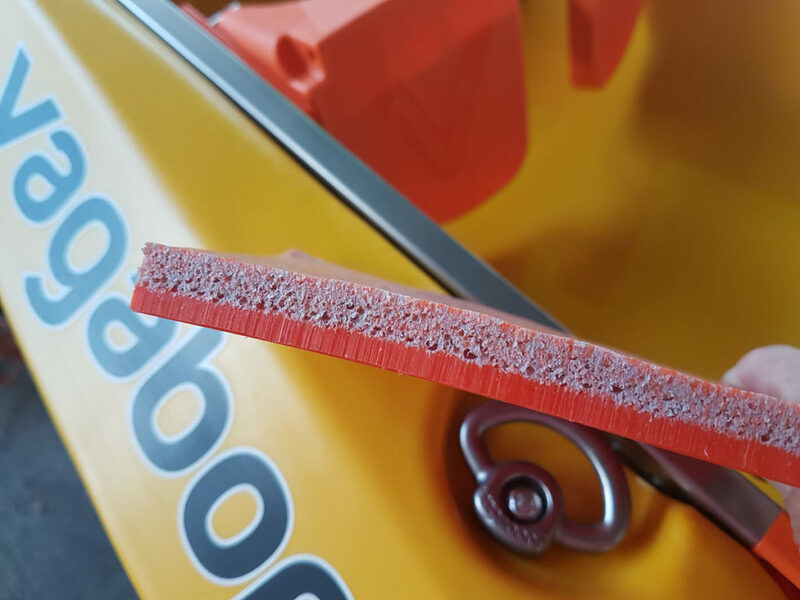 Vagabond Kayaks says that the application of foam LLDPE technology enables them to offer kayaks of superior quality to a market that is currently being overrun by cheaply produced kayaks. “We are in this for the long run, and we want our customers to enjoy not only our innovative designs, but also the extended lifespan of our kayaks,” they add. Back in the 90s, the direction of Celliers’ life was defined when he discovered paddling. By trade, he is a mechanical engineer whose skills have been applied to his passion for paddling. Decades on the water have given him an intimate understanding of fluid dynamics. Over the years he has competed, guided and participated in river marathons, freestyle, canoe polo and raft racing as well as canoeing, surfski, slalom, wildwater racing and oar rafting. Celliers continues to strive to excellence and innovation in his kayak designed and manufacturing processes. This article first appeared in the 2019 Paddler’s Guide. This free digital publication, which showcases a massive variety of watercraft (kayaks, SUPs, inflatables and others), can be downloaded. In South Africa, this article was published in the January 2019 issue of The Paddle Mag. This free digital publication can be read online or downloaded to be enjoyed later on your device.